The Sixers are already knocked out of this year's BPL while the Vikings are fighting for the top two spots. After three defeats on the trot in this edition’s Bangladesh Premier League (BPL), Chittagong Vikings managed to end their losing streak after beating Dhaka Dynamites by 11 runs. The Mushfiqur Rahim-captained team is currently in the third position of the table and another victory would help them enter into the top two. The Net Run Rate of -0.187 is something they need to take care of. Their next encounter is set to take place tomorrow against Sylhet Sixers at the Sher-E-Bangla National Stadium in Dhaka. The Sixers, on the other hand, lost their must-win match against Mehidy Hasan Miraz’s Rajshahi Kings in Chattogram. Subsequently, they bowed out of the T20 tournament. Alok Kapali’s team is definitely short of confidence, but they would want to end their campaign on a positive note. The pitch is expected to be batting friendly and a high-scoring match may unfold tomorrow with both teams, boasting of some explosive batsmen in their ranks. Dew is likely to play its part and bowlers need to be right on the money in order to put a lid on the run-scoring. Mohammad Shahzad and Cameron Delport are the opening batsmen with the in-form Yasir Ali at number three. The onus will be on the likes of Mushfiqur Rahim and Sikandar Raza in the middle-order. Dasun Shanaka and Mosaddek Hossain need to do their job as well. The team would again be looking up to Khaled Ahmed and Abu Jayed to get the breakthroughs. Nayeem Hasan also has to perform. The left-right duo of Liton Das and Afif Hossain form the opening pair. The hard-hitting Jason Roy and Sabbir Rahman would bat at three and four respectively. Nicholas Pooran remains to be the fulcrum of their batting. Mohammad Nawaz and Alok Kapali are the all-rounders. The fast bowling department would be shouldered by Ebadat Hossain, Sohail Tanvir and Taskin Ahmed. Samad is the spinner. 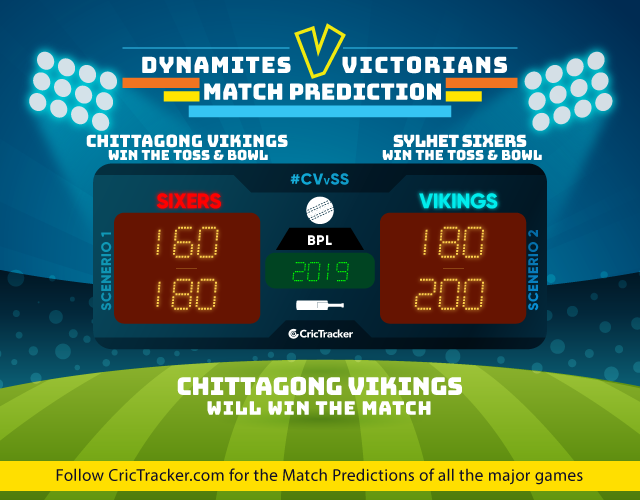 The prediction is for the Chittagong Vikings to win the match.